The Professional Scuba Association International is oldest technical / extended range scuba certification agencies in the world. PSAI was the first agency to offer certification at the diver and instructor levels in both recreational sport and technical diving, almost three decades before anyone else. PSAI was first founded in 1962 as Florida Divers Supply (FDS) by Hal Watts. In 1969 the name was changed to Florida State Skindiving Schools (FSSS). FSSS at the time was one of the largest dive schools in the world, with four locations in Florida and one in St. Lucia. 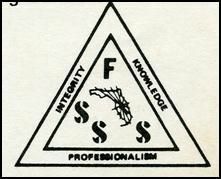 It was as FSSS where the Golden Triangle originated and later evolved into the PSAI logo used today. 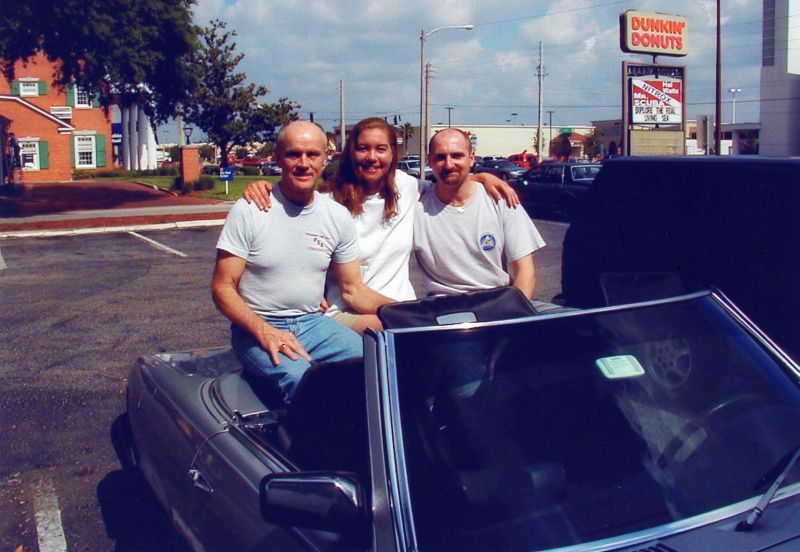 As the organization had expanded well beyond the borders of Florida the name was again changed to the Professional Scuba Association (PSA) in 1988. The tenants, upon which PSA training was built, were so successful they led to further expansion into the international diving arena. Thus, in 1995 the “I” was added to PSA to make it the Professional Scuba Association, International (PSAI). The Florida State Skin Diving Schools logo, where the PSAI “Golden Triangle” originated and later evolved into the PSAI logo used today. Virtually all of the early history PSAI centers on the vision and leadership of the founder, Hal Watts. Hal has often been asked how and why he got so interested in deep diving and deep diving records. Actually, Hal got involved in SCUBA by accident. He moved to Orlando Florida from Atlanta, Georgia back in 1961. Hal belonged to the Georgia Arms Collectors association while living in Atlanta. After moving to Orlando he was looking in the newspaper ads for guns. He came across an ad selling SCUBA equipment. Since Hal had only dived once back in 1955 while in law school, he thought it may be interesting to try it again. Hal responded to the ad, bought the used equipment, which included a 1959 US Navy Diving Manual. The person selling the equipment, Jim Bollinger told Hal to read the manual and he would meet Hal at a local hotel swimming pool the next night and show him how to use it. They met and Hal was “hooked”. Hal’s first dive outside of that pool session was on Washington’s Birthday, February 22, 1962 in Crystal River, Florida to a depth of 51 feet. Man, it was great, except for “having the hell scared out of him” when a “Sea Creature” as long as their boat swam past him. Hal later found out that Manatees, AKA “Sea Cows” were not dangerous. Hal soon became like a sponge getting all the information he could obtain, diving experience possible, and soon founding Florida Diver’s Supply. His knowledge and success in diving soon caught the attention of John Gaffney – the founder of NASDS. Hal soon became the Training Director of NASDS and NASDS OWI # 1. Florida Divers Supply began training cave divers in 1962. Most of this training took place at locations such as: Silver Glen Spring, High Spring, Hornsby Springs, Gourdneck Spring, and Devils Eye. Florida Divers Supply started issuing the first FDS Cave Diver certification cards in 1963. In 1969, Hal Watts was one of the original eight founders of the National Association of Cave Diving (NACD). 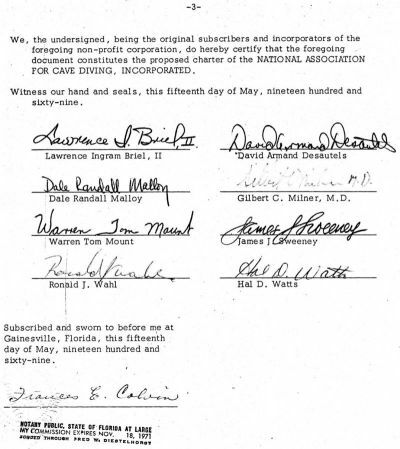 Below you can see his signature along with the other seven founders on the signatory page of the articles of incorporation for the NACD. 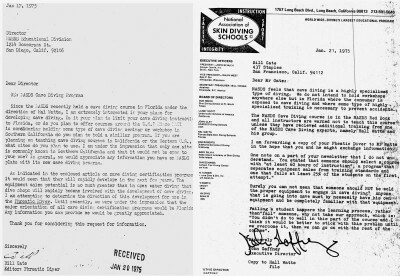 Florida State Skindiving Schools issued Cave Diver certification cards starting in 1970. The Cave Diver text was a section in the FSSS Expert Diver Program Manual. 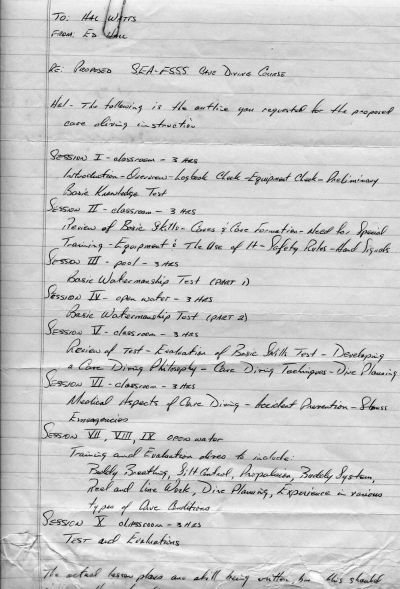 Below is a note to Hal Watts from Ed Hall, sent in 1969, with a proposed outline for the FSSS Cave Diving Course. The expertise of FSSS and Hal Watts in the field of cave diver training during the 1970’s was well recognized. Hal and his staff at FSSS were chosen to be the sole trainers of cave divers for NASDS (National Association of Skin Diving Schools). Below are copies of an exchange of letters between Bill Gates, Editor of Phreatic Diver, and John Gaffney, Executive Director of NASDS, showing Hal’s critical role in training Cave Divers for NASDS. In 1988 PSA, in the FDS & FSSS tradition, continued training Cave Divers and issuing Cave Diver certifications. Now that PSA has evolved into a much larger international certification agency, the PSAI Cave Diving Program has continued to expand into the many corners of the globe. It is with this manual that PSAI carries its legacy of quality cave diver training into the 21st Century. Hal has always kept contacts with his associates in the cave diving community. 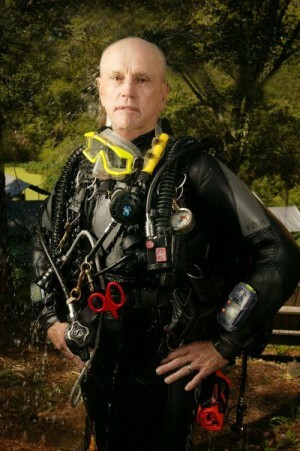 “My fourth dive was in a cave/sink known as Hornsby Sink was to 155’. I was really getting into deep air diving. Of course, back in those days, civilian divers were only using compressed air in the cylinders. In December of 1962, I made my first real deep dive to 250’. During the next several years our dive club, The Forty Fathom Scubapros were making many dives to depths of 250 plus. In September 1965 several club members, including myself made a dive to 310 feet off a wall in Cozumel, Mexico. We brought up a piece of black coral the size of a 6 foot tree. After that dive I just happened to be reading an article on deep air SCUBA diving and found that the current record was set by Jean Clarke-Samazen in 1954 to a depth of 350 feet. Wow, that set off my desire to attempt to break the record since I had already been to 350 feet. Several of our club members started diving to 250+ feet as often as time allowed, training for the new record attempt. We felt we were ready and set out to break the 350 foot record. 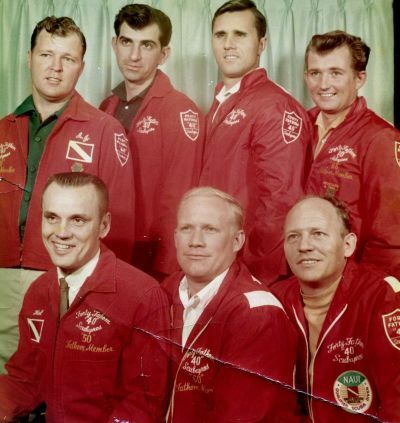 On September 4, 1966 Herb Johnson and I were to attempt the dive, assisted by several club members as safety divers. The boat captain took our team off shore of Loo Key, Florida. The exact depth was not known for sure, but the captain estimated it to be almost 400 feet. After our safety team descended, Herb and I started our descent to go deeper than the 350 foot record. However, we could only reach a depth of 355 feet and landed on sand bottom. Oh well, it was a new record, not by much however, it did break the depth record. Not being satisfied with just barely breaking the record, our club continued to dive deep on a weekly basis. Then in 1966 we felt ready for another record attempt. John Gaffney, founder of The National Association of Scuba Diving Schools (NASDS) made arrangements for a boat off the coast of Miami for our dive. On this dive, the same club members were to be our safety divers. However, A. J. Muns was to be my dive buddy this time. Herb was happy to be “just a 300 foot safety diver”. That sounds funny doesn’t it, “just 300 feet”? We had really set up an elaborate training program that would make the dive as safe as possible. In my opinion, SCUBA diving is not a safe sport. However, the program our club had designed through the years was the “safest way” to participate in an inherently dangerous sport. Being from Georgia, I had to look up the meaning of “inherent”, which means, “Built in risk”. NASDS accepted our Deep Air Diving program and issued Deep Diver Certification cards to divers who EARNED the rating. To prove the depths we reached, A. A. and I each had “clip on flags” to attach to the line at our maximum depth. Diving to these depths requires each diver to take care of themselves, knowing that neither could help the other in an emergency without putting themselves in danger. I won’t elaborate on our training except to say that the program is listed as, PSAI NARCOSIS MANAGEMENT. The new record was set and later listed in Guinness Book of World Records. However, Guinness no longer list SCUBA records. Time passed and I and other Professional Scuba Association International (PSAI) instructors continued to teach and participate in extreme deep air dives on air. In 1970 I made a World Record Deep Air Dive in a cave to a depth of 414 feet. This is still the deep air record in cave diving. I’ll answer the question that I have been asked by my fellow PSAI instructors, which is: What other world record divers have I trained or been affiliated with, either using SCUBA or during Breath Holding (APNEA) dives. The Professional Scuba Association International has the best deep diving program in the dive industry. The above records, with ZERO ACCIDENTS should speak for itself. PSAI Executive Chairman Gary Taylor has also been very involved with helping several Deep Diving Record holders. With his start in extended range deep air diving in the early 1970’s, by 1990 he had successfully logged many deep air dives below 300 fsw (91 msw). Gary provided much of the initial training in extended range diving for Dan Manion, including Dan’s Deep Air and Trimix training. Dan also had training with and gained experience by participating in many of the projects of The United States Deep Diving Team, which was founded and led by Gary Taylor. Gary still has one of the two dive computers that Dan carried with him on his World Record Deep Air Dive. It was Gary who wrote the original Deep Air Manual for IANTD. 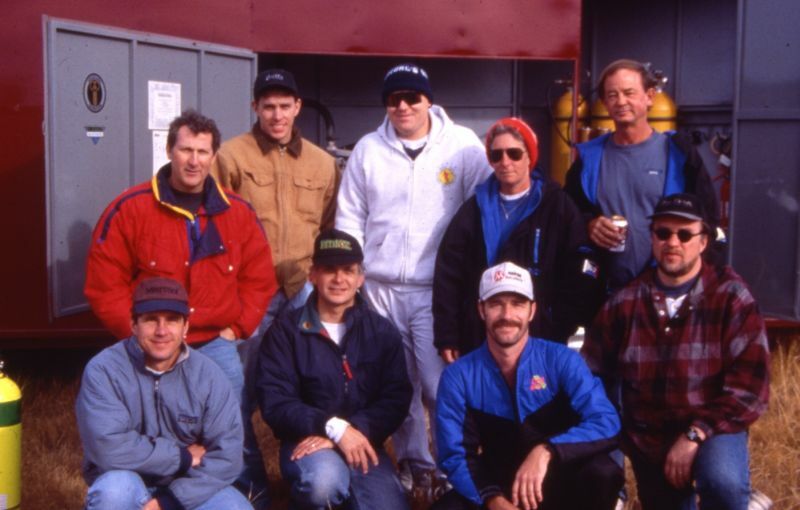 The first Trimix course taught in the Midwest United States. Instructors; Tom Mount (2nd from left) & Gary Taylor (5th from left). Note: Trimix student Dan Manion is 3rd from left. Sheck Exley and Gary often compared notes and consulted with each other. Gary came up with the suggestion of a controlled active electric underwater heater for divers engaged in deep dives with long decompression. Gary’s friend Mark Owens took the idea from concept to manufactured prototype. Gary and Mark tested the prototype. Sheck had mentioned his concern for keeping warm on his extremely long decompression dives. This heater was first used by Sheck on his Trimix – Altitude record dive on August 1993 in Bushmansgat (Bushman’s Hole) in South Africa. Sheck reported it was a, “God-send in helping me to stay warm and sane during the horrendous decompression demanded by my dive profile!” Gary considered it “return favor ” for Sheck giving him the idea for a very unique lighting system used when Gary shot the very first underwater cave video. Gary, being the chronic archiver, still has the original prototype of the heater used by Sheck. In 1970, Hal wrote and copyrighted the first manual for Extended Range Deep Diving for instructors and conducted specialty courses and certification for those interested. One of the projects that Hal wanted was a film. He commissioned Ned DeLoach of New World Publications to produce a 16mm color film “Deep Diving” on location at Wakulla Springs, Florida. Hal Watts formed a specialty diving club known as the “Forty Fathom Scubapros” that was very active diving all over Florida especially at a sink hole that just happened to be 40 fathoms (73 meters, 240 feet) deep! Many of the other divers and organizations simply were not prepared to understand the desire of these early pioneers, so the Scubapros continued largely in quiet. During the 1970s they continued refining techniques and skills to improve in deep diving activities. As history often does, fate brought Hal Watts and Gary Taylor together. Gary started diving in 1969. From the very first dive he was hooked on SCUBA. Gary has always been very inquisitive and this led to him gaining as much experience, knowledge, and satisfying his curiosity in the underwater world by becoming a true explorer and innovator. Gary can still remember teaching SCUBA during the early 1970’s using one of his favorite class guides: the yellow and black book published by U.S. Divers titled Sample Lesson Plan for Basic Skin and Scuba Diving, by Tommy Thompson with Introduction and endorsement by Jacques Cousteau. Gary still has two cherished copies of this publication. In the late 1970’s, Gary purchased one of the first models of the Radio Shack TRS-80 computer. 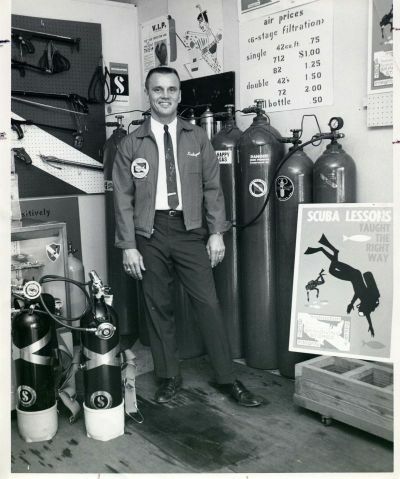 All things revolving around SCUBA, using BASIC programing language, Gary stayed up 48 hours straight, right after his purchase of the computer, writing a computer program which would calculate all the important information a diver would need for single and repetitive dives based on the U.S. Navy Air Decompression Tables. All you would need to do was input your Depth, Bottom Time, and Surface Intervals. A bit ahead of its time considering how very few people owned computers in the 1970’s. Gary also started using this computer to log dive information, write dive specialty outlines, dive exams, etc. During the early 1980’s John Gaffney founder of NASDS became aware of the manuals Gary had written to teach students. John “ambushed” Gary at a dinner meeting and started him on a journey of authoring dive manuals for international use by certification agencies. Since then, Gary has become one of the most prolific authors of dive manuals in the world. To date, Gary has authored over 50 different published titles of dive manuals for three major agencies: NASDS, IANTD and PSAI. He has also written numerous of articles for dive magazines and publications. 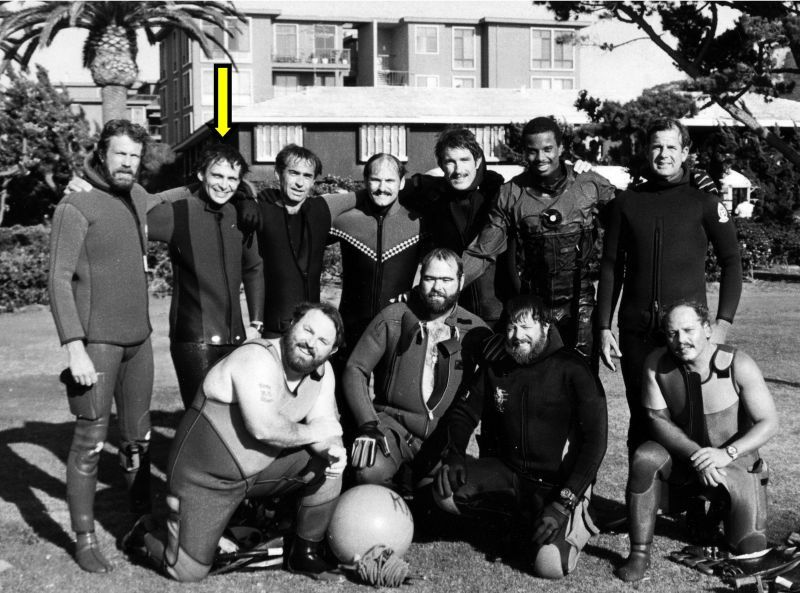 A much younger Gary Taylor (yellow arrow) in the early 1980’s with a group of NASDS Instructors in San Diego, California. In the early 1980’s Gary founded The United State Deep Dive Team. During the 1980’s, The United States Deep Diving Team was engaged in exploration projects which involved extended depth ranges, long bottom times and decompression at dive sites located at altitudes of 1500 meters (5,000 feet) and higher. In the early 1980’s the US Deep Diving Team integrated the multi-level diving methodology presented by Dennis Graver at the IQ 8 conference in 1976 and the Cross Corrections to extend bottom times when exploring altitude sites. The nature of the altitude work of the team’s projects became more demanding by the mid 1980’s, therefore the team chose to use nitrox for a safety factor during decompression. Modified Cross Corrections were used at first. When the Buhlmann ZH-L16 Altitude Tables were published, they were used with safety modifications for nitrox. Later, more creative and direct uses for nitrox and altitude were devised. Later modifications were made upon the full publication of the ZH-L16 algorithm in Tauch Medizin. In early 1988, Gary Taylor came up with the Nitrox to Air at Sea-level Altitude Equivalency Methodology for use by the U.S. Deep Diving Team in their projects. In late 1988, Gary devised the Theoretical Ocean Air Depth (TOAD) Methodology for the team’s altitude projects. Publication of these methodologies didn’t take place until April 1996, when Gary authored the IANTD Altitude Diving Manual. In the spring and summer issues of Immersed Magazine Gary wrote a two part article through which most of the world was introduced to these methodologies he had devised. One of the very first publically available table generating software programs, which allowed the use of nitrogen, oxygen and helium mixtures, was Dive Profile Analysis (DPA). Gary was good friends with the creator of this software, Corey Berggren, having known him many years from their association in the cave diving community. Corey based Bulhmann ZH-L16 algorithm. After discussing the use of the software with both Corey and several phone calls with Dr. Buhlmann, Gary had an understanding of how best to use this program to produce Trimix Dive Tables for more extreme depth altitude diving projects the U.S. Deep Diving Team was ready to take on. The team became the first to use Dive Profile Analysis (DPA), within a few weeks of it’s 1992 release modified fashion, based on Corey’s and Bulhmann’s input, to generate tables for the use of Trimix at altitude and actually dive them. From Gary’s personal conversations with Bühlmann, (relating to the use of the ZH-L16 algorithm for the development of tables for industrial hyperbaric operations, as well as special tables for the 1994 World Record deep air dive of Dr. Dan Manion), it is easy to say that he was a researcher who paid very close attention to all the details. Gary headed the development of the first Bühlmann recreational dive tables to be used by a major U.S. certification agency, NASDS. The Theoretical Ocean Air Depth (TOAD) Method, another innovation conceived by PSAI Executive Chairman – Gary Taylor, for using nitrox for diving sites at altitudes above sea-level. 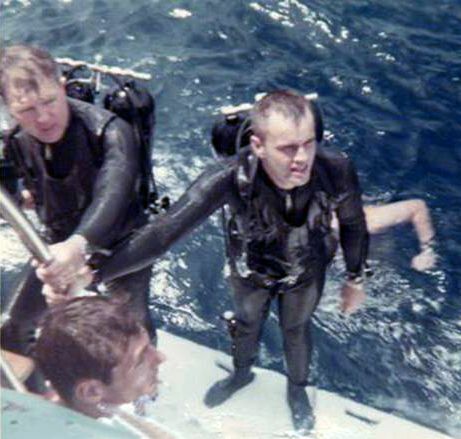 In gathering information on deep air diving to train and improve upon what the United States Deep Diving Team needed for safely conducting their exploration and dive projects, Gary became well aware of Hal Watts (even before the founding of the team). Gary had been warned by the “powers that be” to not tell anyone how deep he was diving and to stay away from Hal Watts. Maybe when you are more forward thinking than those believing in the sacredness of the 130’ (40m) depth limit, you become a heretic. Gary remembers at the time thinking, “One day Hal and I will cross paths and I bet we will be the best of friends.” That actually happened in the late 1980’s. By then Gary had already started diving at 40 Fathom Grotto and soon Hal and he were hitting it off very well. United States Deep Dive Team members at a Project Deep Desert dive. Bob Hambidge 2nd row far left. Gary Taylor front row 2nd from left. 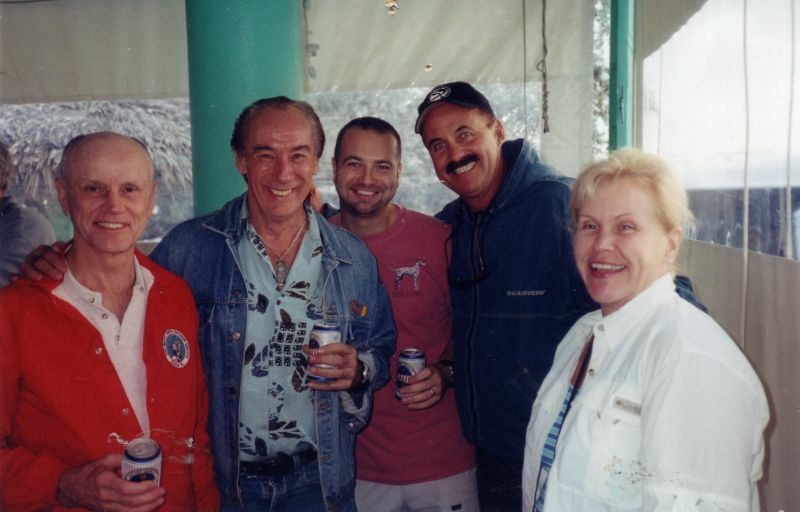 In 1992, Gary was working on his IANTD Trimix Instructor Trainer and had been invited to come stay with Tom Mount and be a part of Hal’s Trimix Instructor course. This brought Gary and Hal even closer as friends and fellow professionals. It was during this year that Gary, started working on putting together Power Point slides to help Hal out for the PSAI Deep Air Program. 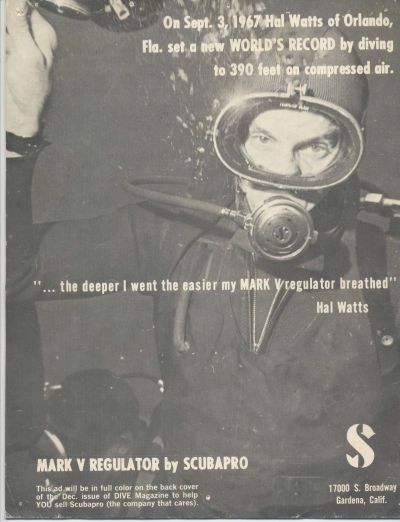 Soon after Hal’s Grotto manager, Bob Hambidge joined the United States Deep Diving Team and took part in Project Deep Desert. Left to Right: Gary Taylor, Tom Mount, Terrance Tysall, Hal Watts on Trimix dive summer 1992. Gary liked what he saw and started teaching PSAI courses in the 1990’s. The more they got to know each other, the more they realized they had a common philosophy and vision for the dive profession. Hal knew Gary’s past experience and skills. 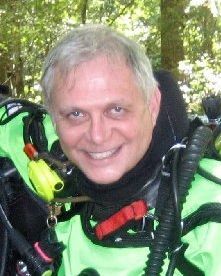 Gary was not just known as a prolific dive manual author but had served as an NASDS International Training Director as well as IANTD Advisory Board Member and Instructor Trainer-Trainer. In early 2005, Hal appointed Gary to handle PSAI in the Americas. The following year Hal came to stay with Gary in Michigan for a month to work on PSAI Manuals. 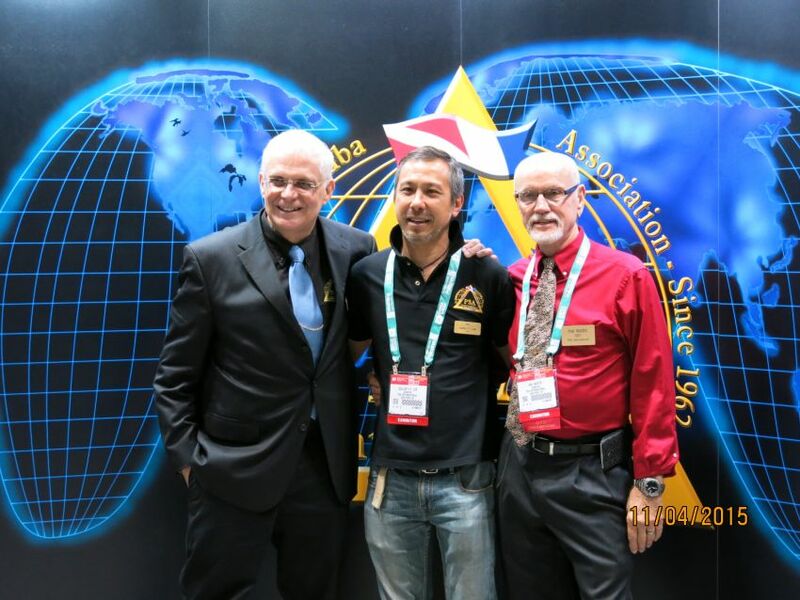 During the beginning of PSAI’s global expansion, Gary and Hal both saw the opening for the development of innovative educational / training materials for PSAI. During that visit, the common shared vision for PSAI soon evolved into Gary being appointed PSAI President and co-owner of PSAI. As Hal moved further into the retirement phase of his life (yet still very much involved in PSAI), Gary became PSAI Executive Chairman in November 2010. In October 2015, Gallup Y.T. Lee became a member of the PSAI Executive Board as PSAI Chief Operations Officer (COO). In February 2016, Manuel Marrero joined the PSAI Executive Board as Chief Administrative Officer (CAO) of the PSAI International Academy. On February 26, 2016, PSAI made diving history by opening the PSAI International Academy on the island of Vieques, which operates as a division of PSAI Global Headquarters. The PSAI International Academy has 2 and 4 year extensive dive professional training programs, as well as offering a series of Professional Master Programs for properly qualified PSAI Professionals to continue their education and deepen their knowledge base at highly advanced levels. The PSAI Executive Board Members, PSAI Advisory Board Members, International Training Directors, and Country Licensees are all very much involved in sharing the vision of taking PSAI boldly into the future. PSAI Global Headquarters operates its offices out of Sand Point, Michigan. The new generation of programs and materials developed by PSAI have caught everyone’s attention. PSAI continues to grow at a fast pace internationally, with our expanding number of PSAI Country Licensees and PSAI Instructors throughout the world. PSAI Founder & CEO Hal Watts came up with the idea of the octopus regulator (safe 2nd). PSAI was the first agency to require power inflated Buoyancy Control Devices (BCD’s) and submersible pressure gauges (SPG’s). PSAI was the first agency to teach technical – extended range diving courses. PSAI is the only agency which teaches Narcosis Management®. PSAI is the only agency providing training for divers breathing air to 240 feet (73 meters). PSAI was one of the first certification agencies to issue Cave Diver certification cards in 1963. PSAI Founder & CEO Hal Watts authored the first extended range diver and instructor manuals. PSAI Executive Chairman Gary Taylor authored some of the very first recreational sport and technical diving specialty manuals. PSAI Founder & CEO Hal Watts and PSAI Executive Chairman Gary Taylor are both Platinum Pro Award recipients with over 10,000 dives each.